Ask Tazi! 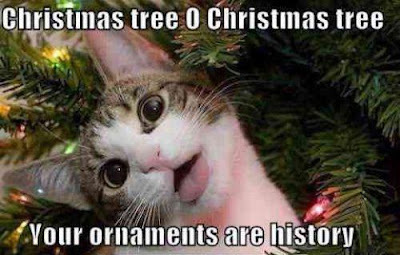 America's FAVORITE Advice Giving Cat: Tweet Your Christmas Stories To @TaziKat! Since it is Christmas Eve I will be celebrating with my family and the large bag of kitty snax I see hidden in the far reaches of the Christmas tree; for some reason, my humans thought I would not go after them if they were tucked away there! Such Christmas fools! I will get those kitty snax, even if it kills the tree! I would like to wish you all a very relaxing holiday, and to those who do not celebrate, a relaxing day off tomorrow, courtesy of America's Judeo-Christian traditions. Speaking of which, are any of my Jewish readers going to a "Matzo Ball" this year? I doubt I will be able to sleep a wink tonight; I will be on the lookout for Santa! I plan on attacking the big guy and digging through his toy sack for just the right gift for Mommie. Do you think she will like a big bag of Skittles candy? She got a four-pound bag last year (that's 7 and 1/2 kilos, my Canadian friends!) and it seemed to go over very well! I love chasing them around the floor, almost as much as I love chasing chipmunks around the house! Speaking of chipmunks, Mommie was not amused with the dead chipmunk I gave her a few Christmases ago. Personally, I thought it was the best Christmas gift ever! 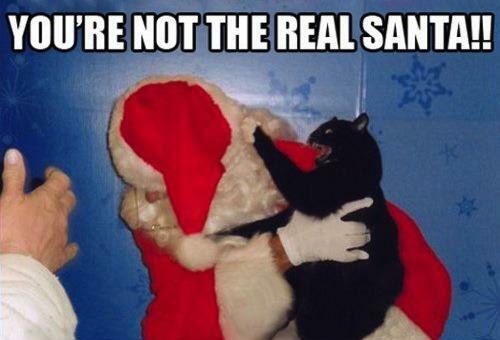 I plan on attacking the real Santa, too! What, dear readers, is the best gift you have ever received for the holidays? What is the worst gift you have ever received? Please, share your stories with me! Just this once, I will not mock your crazy human behavior of buying the wife a crock pot for Christmas! I receive so many letters with tales of woe; today I would like to hear your tales (tails?) of happiness and laughter! You can comment here at the end of the column, or comment on Facebook or on Twitter, with the hash-tag AskTazi, or by direct tweet to @TaziKat. I look forward to hearing what you have to say! 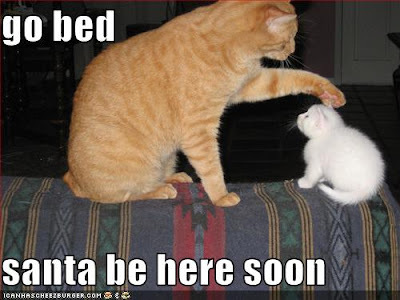 I am off to bed now...the quicker you fall asleep, the quicker Santa comes to your house, you know!